Discover the unexpected charms and fascinating history of Cartagena, one of southern Spain’s lesser-known gems, during a 3-hour guided walking tour. Learn about the city’s ancient history and founding as the city of Carthago Nova, an ancient settlement dating back to the Carthaginians in 228 BC, and see its historic amphitheater and Punic Wall. Then jump a few centuries forward to the medieval era during a visit to La Concepción Castle before finishing your day in the present by exploring Cartagena’s modernist architecture in the city center. Less than average compared to the other excursions we took in Spain. Only the two Roman ruins were worth seeing. Tour guideAlisa was better than the average guide and was extremely knowledgeable and helpful. We have a big complaint about the size of the group on the tour. It was advertised as a small group walking tour. We expected 10 to 12 people on the tour but it turned out there were 32! This proved very unwieldy for some of the stops on the tour. Excellent tour! We would not have known so much was in the city had we not done this with our guide, Jorge. He was fabulous and gave us great advice and where to go and what to see after we finished. We really enjoyed this tour and especially Alisa! Just walked off the ship and met her at the end of the pier, just a short walk. Not a stressful walking tour at all... Alisa was so informative and just a delight to listen to! So much history here that one can learn, be amazed and enjoy. Would certainly recommend this tour to anyone. Excellent tour guide with a wealth of local and historical knowledge. Small group of nine made it easy for tour guide to interact with all participants. Amount of walking was significant with many stairs so age and physical limitations could make this tour difficult for some. First three hours of tour were the best with the last half hour being the weakest part of the program. Three hours might better fit the content and the physical demands of the walking tour. Not a lot in Cartegena but this tour was informative and interesting for the price. Couldn't beat the price. Alisa, our tour guide, did an excellent job!! She explained the history in a way that was easy to understand. 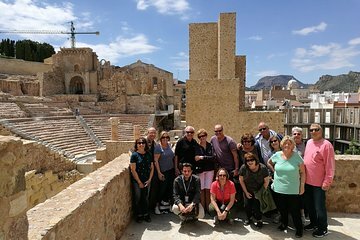 We came away from the tour with an appreciation of Cartagena's part tin the history of Spain.